First flown in Autumn 1936, two Ha 139 - the Nordmeer and Nordwind - were delivered to Deutsche Luft Hansa in 1937. In the summer and autumn of that year they made 14 experimental transatlantic flights between Horta (Azores) and New York, operating from depot ships. In the spring of 1938 Nordwind went into service on the regular South Atlantic mail service between Bathurst (Gambia) and Natal (Brazil). Up to the end of June 1939 the seaplanes had successfully completed 100 transatlantic flights: 40 across the North Atlantic and 60 across the South Atlantic. For the 26 transatlantic flights of 1938 between the Azores and New York an improved and larger type of Ha 139, the Ha 139B Nordstern, was delivered. 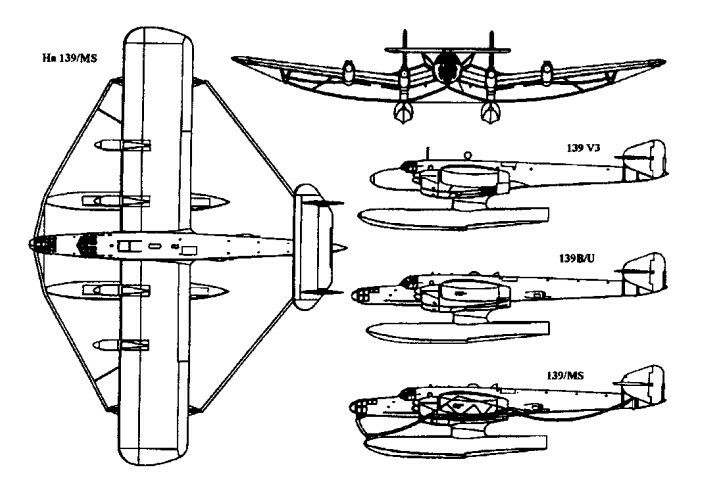 The Ha 139 type was also used to a limited extent during World War II as a reconnaissance, mine-laying and ambulance aircraft. Power was provided by four 447kW Junkers Jumo 205G engines. Only four examples were built.